It takes patience and a whole load of practice, but you can get your favourite pooch trained on a dog agility course in no time. 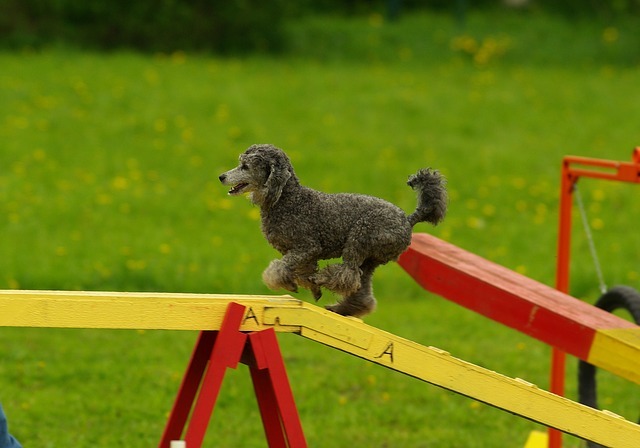 Dog agility courses aren’t just about exercise and training. If your dog has lots of energy and can occasionally be destructive, this type of training may be the perfect solution to get them focussed and tire them out. To get you started, here are a few tips to help you create a dog agility course for beginners in your own home. Making your own dog agility training equipment. 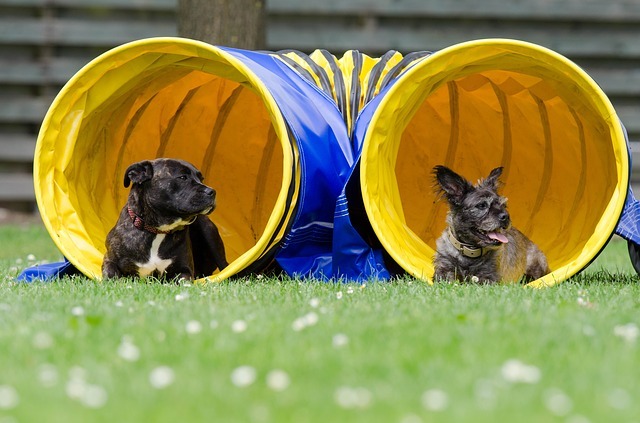 Full dog obstacle courses look pretty impressive, but you can create your own really effective versions at home with just a few tools and a little creativity. Jump obstacles. This one is an easy DIY obstacle. If you’ve got a spare curtain rod, PVC pipe from a plumbing project or even just a stick, just place it on top of two boxes and you’re good to go. Just keep in mind that everything should be collapsible so they won’t get hurt if they lose their nerve at the last moment. Tunnel. These are easy to pick up from a toy shop and are relatively cheap too. If you have young children you may even have one lying around you can use with your dog. Weaving obstacles. Pick up some small football cones from your local toy shop. These should be lightweight, just in case your dog runs into them as he’s learning to weave. Before you get started with training, there are a few tips you should always keep in mind for every manoeuvre. Be patient. By staying patient and regularly taking time to train your dog, it’ll be a more positive experience for both of you. Motivation. Find out what motivates your pup. Do they love fuss from you when they get something right or is a treat their favourite reward? Use this when you train with them, although use treats sparingly so they don’t over eat. Space. Ensure you have enough space for your dog to use the obstacles, with extra room factored in in case they fall or over shoot a jump. Consistency. Throughout your training, pick certain hand gestures or commands and stick to them, by staying consistent your dog will pick up on the moves quickly. Jumping obstacle. Start low and easy so your dog can get used to the equipment and start to enjoy jumping over it. If they’re a little cautious to start with, use treats or attention as motivation to help them feel comfortable. When they’re happy jumping over a low bar, gradually start to raise the bar and build them up. Tunnel obstacle. Some dogs may be cautious when starting with a tunnel for the first time, others may dive right in. If they need a little encouragement, a great way to start them off is to go through the tunnel yourself and call them after you. Weaving obstacles. Begin slowly, with the cones further apart and walk your dog through them, encouraging them to follow you as you go. As they get used to the movement and what you expect from them, they’ll start to move more quickly through the obstacle. Create your own dog agility course at home with this quick guide and your dog could be competing in no time. Want more? Try our top tips for doggy brain training for some great ideas on how to keep your favourite pooch motivated. If you’re looking to keep your dog healthy and fit, but don’t know where to start, have a look at our tips for overweight dogs here.